In case you have not noticed, Phoenix loves our party buses. Offering AZ the most premiere and sophisticated party buses in the industry, there's no event that should go without one. Whether you like to dance, or want some room to relax with friends, our party buses will exceed your needs while you enjoy all that Arizona has to offer. 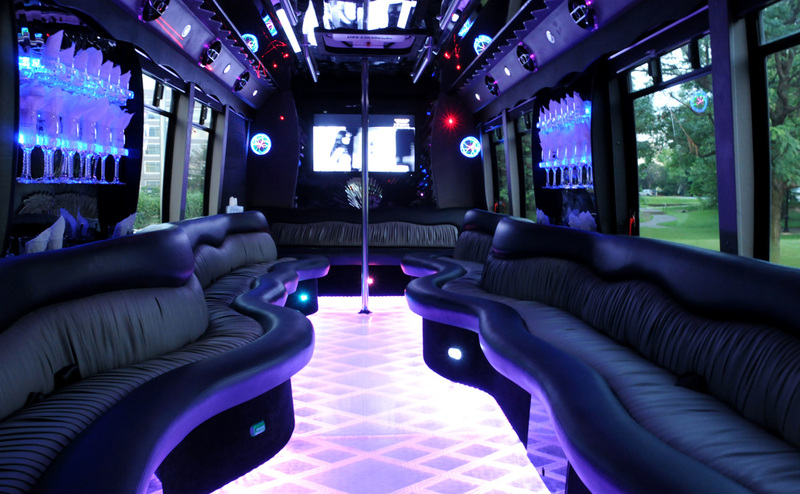 Why Choose Our party buses? 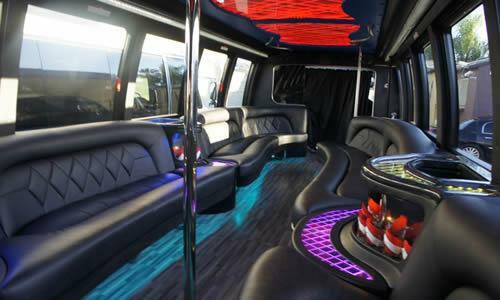 Here at Phoenix Limo Service we like to make a big deal about our party bus rentals. Phoenix has a lot to offer, and we know it's best experienced aboard one of our state of the art party buses. Equipped with on board amenities and entertainment that will impress even the most over-the-top friends of yours. Different Size Party Buses - Offering a variety of different sized party buses to accommodate different size groups. We Offer 20 passenger party buses, 28-32 passenger party buses, and 40-50 passenger party buses. Choose the size that's right for your group, and don't be afraid to go too big if you want extra room. Being able to transport your entire group around town and from one spot to another is not only a fun way to celebrate and party, but also a great safe driving tactic so everyone can relax and nobody has to be the DD. Instead sit back, relax, and party in style while you ride into the night! Wrap around Seating. Get comfortable as you cruise through AZ in one of our premier buses. Enjoy the view of the Arizona scenery and the excitement of your friends dancing, while you relax on our luxury wrap around seating. With room for everybody, sit down, lay back and enjoy the ride. Instead of looking forward like traditional transportation you now can conversate and interact face to face while you sit on our plush, comfortable seating. Wanna be the enetrtainment? Get up and dance around and get others to join in! The party doesn't stop! Surround Sound. Turn down for what? Let the music inspire you and your friends to stir it up on the dance floor. With an auxiliary cable to attach to mobile music devices (like your iPhone), play your favorite music uninterrupted all night long. Who needs a DJ when you can que up your playlist get lost in the music and dance the night away. A new way to enjoy music when driving down the road! Stage Lighting. Its not a party without some lights. Let our built in lighting, turn up your night and set the mood. With our modern lighting effects you will start to understand why we call it a party bus. Plus we want the ambieance and atmosphere to appeal to you and your fellow partiers. 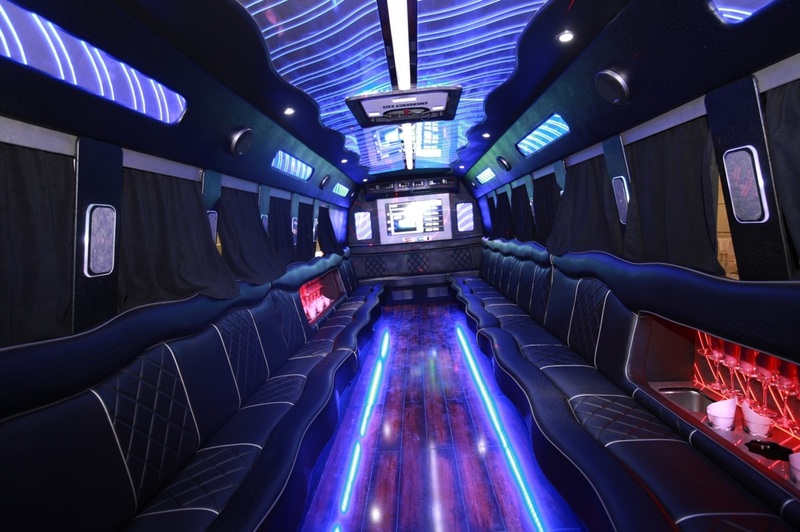 Creating the perfect lighting effects will enhance your party bus experience and music! Party On! Excellent! Dance Pole. Get your workout on, nobody's judging. With on board dance poles there is no reason to leave the bus. Let the men show the women how its done, and be your own live entertainment for the night. Refreshments. The party bus will get you thirsty. Enjoy on board refreshments that we supply, or bring your own. With our chauffeur feel free to let your inhibitions down, and rest assured that you will arrive safely at home, when everything is said and done. Having a safe, experienced & professional driver will allow you to completely relax and have fun. Life is filled with responsibilities, this is your night to shine and worry about nothing other then enjoying your friends, the music, maybe even the dance pole while your Chaueffer takes care of the rest! Whether for a bachelorette party, prom, or any other occasion, request a quote, and reserve one of our party buses today! Have an occasion you don't see listed? At Phoenix Limo Service we know everyone has their own special occasions or dates that call for a limousine. We do not discriminate, instead we encourage you to give us a call or send in a quote form for any occasion "outside the box" unique, or spontaneous. It's your right to celebrate, have fun and relax!